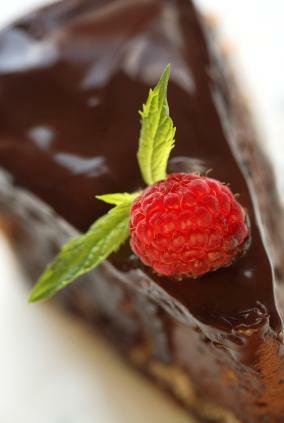 One of the most famous chocolate tortes in the world is the Sacher torte. Once you make this chocolate torte, you will have a rich and decadent chocolate dessert that is sure to please all. There are two cakes that vie for the claim of the original Sacher torte and neither source will divulge its recipe. The only difference between the two cakes is that one is split into two layers and has apricot jam between the layers, the other is one layer of cake with apricot jam just under the chocolate glaze that covers the torte. If neither place is willing to give up its secret recipe, then how does anyone else make a Sacher torte? Well, we can get pretty darn close. As with Oysters Rockefeller, another closely guarded recipe, the basics of the recipe can be guessed to a close enough approximation. If we take a Viennese chocolate torte recipe, add apricot jam to it, and coat it with a chocolate glaze, we can get a close copy of the recipe. Or you could just pop over to Vienna and enjoy your torte there, but if international travel isn't in your plans for this weekend, this chocolate torte recipe will make you think your have just landed in the Austrian capital. I have given the measurements for this recipe in ounces rather than cups and spoons because weight is more accurate and will help you create a better torte. If you are going to pursue baking seriously, you should consider getting a reliable scale. It will come in handy more often than you think. This will make one 8-inch cake that can then be used to make a Sacher torte. Mix together the cake flour, cocoa powder, and almond meal. Sift the ingredients together to make sure they are well mixed without lumps. Using your stand mixer, cream the butter and 3 ¾ ounces of sugar together until they are light and fluffy. Add the yolks one at a time until they are all fully incorporated. Whisk the egg whites and 2 ounces of super fine sugar tighter to medium peaks. Carefully, and gently as possible, fold the whipped egg whites into the creamed butter. Carefully and gently fold the dry ingredients into the wet ingredients. Spray an 8-inch cake pan with non-stick spray. Spray the paper with non-stick paper. Pour the batter into the sprayed pan. Bake at 350 degrees for about 45 minutes or until a toothpick inserted into the center of the cake comes out clean. Let the cake cool for 10 minutes and then turn the cake out onto a rack and let it completely cool. While the cake cools, you can gather up the next set of ingredients. Mix the brandy and simple syrup together. Carefully soak the bottom layer and top layer of the cake with the syrup. Spread the bottom layer with a thin layer of apricot jam. It is easier to spread the jam on the moistened cake if you warm it first. Place the cake on a rack that has been placed on a cookie sheet and lined with parchment paper. Place the top layer on the bottom layer. Pour or spread 2/3 of the chocolate glaze recipe (from below) over the cake. Let cool in refrigerator until the first coat has set. Pour or spread the remaining glaze over the cake. Return the cake to the refrigerator to completely cool. Using a Bain Marie or double boiler, melt all ingredients together until smooth. Mix the ingredients together in a saucepan over a medium heat until the sugar is completely dissolved. Bring to a boil and let boil for five minutes.